The Giraffe Play Blankie is an adorable, exciting and interactive combination of a teething toy, a comfort blanket and activity toy all in one. Suitable from birth onwards, the Giraffe Play Blankie has many entertaining features  perfect for keeping little ones entertained. Each Play Blankie has a soft, friendly animal face and body, and four entertaining and engaging activity paws. They are visually appealing with their brightly decorated fabrics and tactually entertaining with different textures to feel and squeeze, including a crinkly iridescent one! Each paw has something for the baby to interact with - one of the paws has a teether/chew piece, perfect for teething babies and sore gums. Another of the paws has a jingly rattle, a third with colourful fabric tags, and the fourth has a push to squeak stripy star thats guaranteed to make any baby giggle. 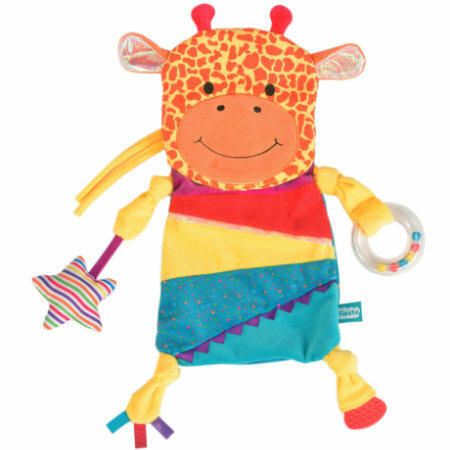 The Giraffe Play Blankie appeals to multiple senses and to a babys need to be comforted. It is the perfect cuddling comforter, and even has two cords so that it can be tied on to a cot or buggy and provide comfort and entertainment wherever you go!